“If you are a big tree, we are a small axe.” So goes a Jamaican proverb, famously popularized by Bob Marley. It is a proverb with wide Caribbean resonance: a “small axe” is a subaltern agency of criticism. The inspiring ethos that informs this idea is that relatively marginal voices of creativity and dissent can have disproportionate critical effects at least insofar as they remain responsive and attuned to the changing contexts of our Caribbean life in the global world. We aim to embody this ethos. Thus the aim of the Small Axe Project is to participate both in the renewal of practices of intellectual and cultural criticism in the Caribbean and in the expansion and revision of the scope and horizons of such criticism. We acknowledge of course a tradition of criticism in and about the regional and diasporic Caribbean. We want to honor that tradition but also to argue with it, because in our view it is in and through such argument that a tradition renews itself, that it carries on its quarrel with the overlapping generations of itself: at once retaining and revising the boundaries of its identity, sustaining and altering the shape of its self-image, defending and resisting its conceptions of history and community. It seems to us that many of the conceptions that guided the formation of our Caribbean modernities—conceptions of class, gender, nation, culture, race, for example, as well as conceptions of sovereignty, development, and democracy—are in need of substantial rethinking. The concrete expression of this ethos of generative rethinking to which we are committed is embodied in the four platforms that now comprise the Small Axe Project: Small Axe, sx salon, sx visualities, and sx archipelagos. Each is distinct in the objects they focus on or the media they deploy; but they are all effectively the overlapping idioms of one interconnected and reflexive project whose overall collective objective is to participate in stimulating, expanding, and deepening the critical conversation about the mentalities and sensibilities and practices that constitute our Caribbean intellectual and cultural traditions. 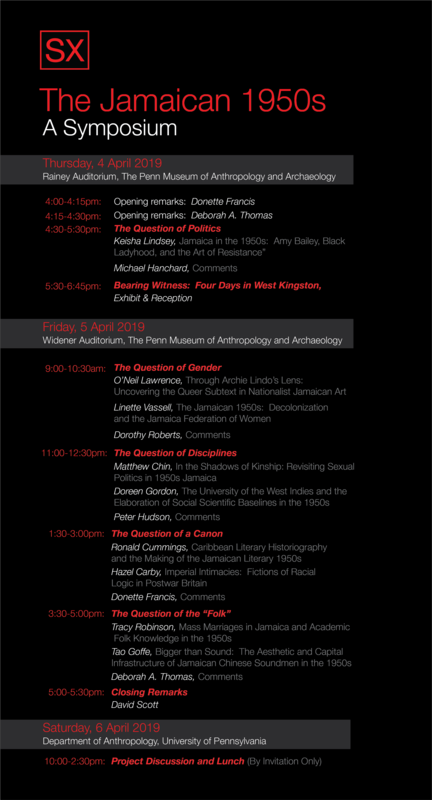 Watch the livestream for "The Jamaican 1950s: A Small Axe Symposium"
You can also watch the livestream for "The Jamaican 1950s: A Small Axe Symposium" on Facebook. Small Axe is our peer-reviewed print journal. It is the inaugural of our four platforms. 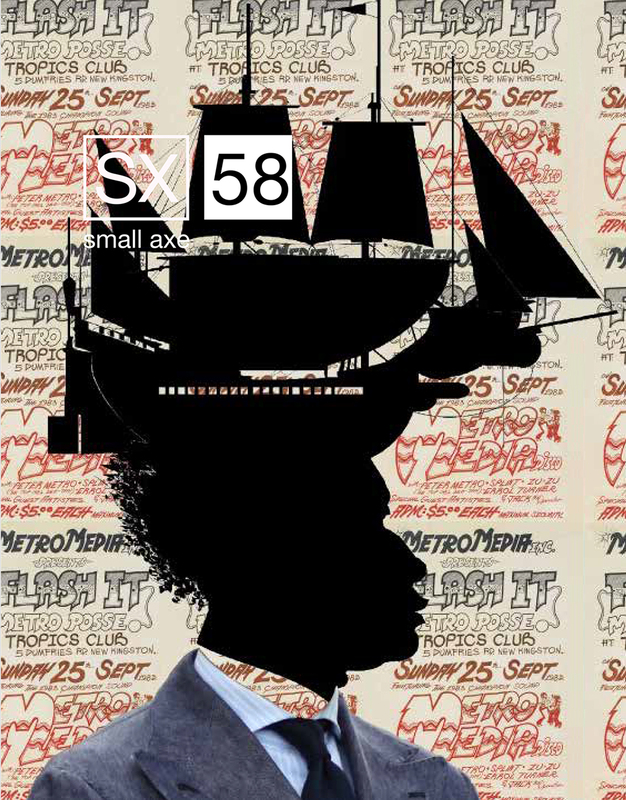 A journal of criticism conceived in the tradition of a long line of independent Caribbean journal projects, Small Axe is committed to rethinking the dominant narratives through which the regional and diasporic Caribbean have been imagined and conceptualized. Taking into account anglophone, francophone, and hispanophone intellectual and cultural traditions, the journal aims to offer a platform for the expansion of critical Caribbean dialogues. Small Axe is published by Duke University Press three times per year, in March, July, and November. Our digital forum for innovative critical and creative explorations of Caribbean literature, broadly defined. Caribbean creative writing has always wrestled with the idea of an aesthetic form that engages regional and diasporic understandings of our changing realities. As a forum, sx salon aims to stimulate these sensibilities and preoccupations across different literary genres. Initiated in 2010, sx salon appears three times per year (February, June, and October). We publish literary discussions, interviews with writers, reviews of new publications (creative and scholarly), and poetry and prose by Caribbean writers. sx archipelagos embraces and engages the “digital turn” in the humanities and social sciences. Our aim is to build and sustain a critical space for digital scholarship and for scholarship about the digital, within and emerging from the Caribbean and its diasporas. In doing so, we mean to challenge many of the conventional conceptions of what counts as valid scholarly work and who constitute valid scholars. We seek to do this by encouraging serious collaboration with ever-wider circles of like-minded critical thinkers and by narrowing the gap between researchers and the communities with which we are committed to being in dialogue. Our approach to these concerns is illuminated by the first light of the long arc of Caribbean remembrance, and so remains vigilant to material, ecological, identity, and liberatory considerations. sx archipelagos will be published annually. The Small Axe Literary Competition encourages the production and publication of Caribbean fiction and poetry in English, Spanish and French. The competition focuses on poetry and short stories from emerging writers whose work centers on regional and diasporic Caribbean themes and concerns.This competition is part of the Small Axe Project's ongoing commitment to Caribbean cultural production and our mission to provide a forum for innovative critical and creative explorations of Caribbean reality. With this competition, we hope to encourage and support the region's rich literary heritage, in the tradition of precursors such as Bim (Barbados, 1942), Kyk-over-al (Guyana, 1945), Tropiques (Martinique, 1941), Focus (Jamaica, 1940), Orígenes (Cuba, 1944), La poesía sorprendida (Dominican Republic, 1944), Revista del Instituto de Cultura Puertorriqueña (Puerto Rico, 1945), Conjonction (Haiti, 1946), Revista Casa (Cuba, 1960), and Savacou (Jamaica, 1970).